ProSuite is an integrated collection of Provalis Research tools that allow one to explore, analyze and relate both structured and unstructured data. It allows one to perform advanced computer assisted qualitative coding on documents and images using QDA Miner, to apply the powerful content analysis and text mining features of WordStat on textual data, and to perform advanced statistical analysis on numerical and categorical data using SimStat. 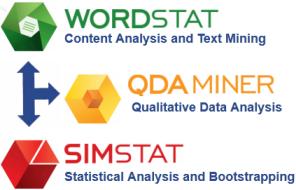 The interoperability of QDA Miner, WordStat and SimStat allows researchers to integrate numerical and textual data into a single project and to seamlessly move back and forth between quantitative and qualitative data analysis. More importantly, the integration of structured and unstructured data into a single data set allows one to explore connections between text responses and numerical or categorical data. For example, one can easily analyze relationships between closed and open-ended survey questions, identify social media topic trends over time, find out how supporters’ comments differ from those of detractors, or easily explore differences in word usage between gender, age groups, or geographic locations. There are many ways to extract information from textual data. 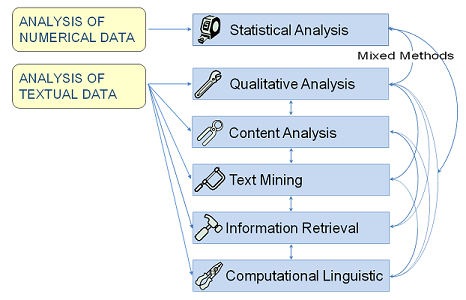 Techniques such as in-depth qualitative data analysis, powerful exploratory text mining, or carefully designed content analysis are just a few examples of the range of approaches available today. Each text analysis method has its own strengths and weaknesses, and no single method is appropriate for all text analysis tasks. Yet, most text analysis tools on the market today rely on a single approach to text analysis. At Provalis Research, we are committed to offering a software platform that does not confine researchers and analysts to a single approach, but allows them to choose the one that best fits the research question or the available data. We also strongly believe that a single text analysis task often profits from combining several methods; our software platforms facilitates this type of integration. One may thus combine in many ways the automatic content analysis and text mining features of WordStat with the manual coding an annotation available in QDA Miner.